1. Type 2 diabetic patients at high-risk for cardiovascular events treated with the ultra long-acting insulin degludec experienced cardiovascular events at an incidence noninferior to patients treated with glargine. 2. Patients treated with degludec experienced lower rates of severe hypoglycemic events compared to those treated with glargine. Study Rundown: Patients with type 2 diabetes are at elevated risk for cardiovascular events. Prior studies have reported differing changes in risk of cardiovascular events for type 2 diabetics treated towards varied levels of glycemic control, with some suggesting intensive glycemic control raises risk for cardiovascular events. This study sought to determine if degludec, an ultra long-lasting basal insulin, was noninferior to the basal insulin glargine in terms of cardiovascular event risk. An international, randomized, double-blind trial recruited type 2 diabetics with a high risk for cardiovascular events. Patients were randomized to receive either degludec or glargine as their basal insulin and followed to assess for death due to cardiovascular events, hypoglycemic events, and adverse events. Patients treated with degludec experienced rates of death due to cardiovascular events noninferior to those treated with glargine. Additionally, degludec treated patients experienced a lower rate of severe hypoglycemic events. This study’s strengths include its enrollment of many patients with high cardiovascular risk, though the follow-up time of 2 years may limit its generalization to patients treated with degludec for longer periods of time. In-Depth [randomized controlled trial]: This randomized, double-blind study recruited 7637 patients from 2013-2014 at many international sites and followed them for 2 years. Eligible patients had type 2 diabetes at high risk for cardiovascular events and were being treated with at least one antihyperglycemic agent, though once in the trial they discontinued any basal insulin they were on prior to the study. Randomization in a 1:1 fashion placed patients in either degludec (n = 3818) or glargine (n = 3819) groups. Patients took their basal insulin in a manner and dose defined by the study. The primary outcome of this study was time-to-event analysis of death from cardiovascular causes, and secondary outcomes included events of severe hypoglycemia, and adverse events. The primary outcome occurred in 8.5% (325/3818) of the degludec and 9.3% (356/3819) of the glargine groups (hazard ratio, 0.91; 95% confidence interval [CI], 0.78-1.06; p < 0.001 for noninferiority). No difference was detected in incidence of death between the degludec and glargine groups (5.3% vs 5.8%, respectively; hazard ratio, 0.91; 95% CI, 0.76-1.11; p = 0.35). Per 100 patient-years, 3.70 and 6.25 severe hypoglycemic events occurred in the degludec and glargine groups, respectively (rate ratio, 0.60; 95% CI, 0.48-0.76; p < 0.001 for superiority). There was no significant difference between groups regarding changes of glycated hemoglobin levels during the trial, and a mean glycated hemoglobin level level of 7.5% was found in both groups at the end of the trial. Adverse events occurred at a rate of 44.7 and 50.1 events per 100 patient-years in the degludec and glargine groups, respectively. The results of this study indicate treatment of type 2 diabetics at high risk for cardiovascular disease with degludec is noninferior to treatment with glargine in terms of incidence of cardiovascular events. ©2017 2 Minute Medicine, Inc. All rights reserved. No works may be reproduced without expressed written consent from 2 Minute Medicine, Inc. 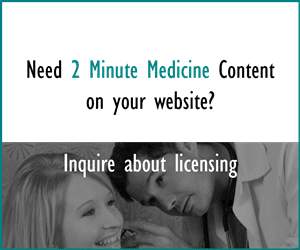 Inquire about licensing here. No article should be construed as medical advice and is not intended as such by the authors or by 2 Minute Medicine, Inc.